If you have read all books about Katy by Susan Coolidge — you can't pass "Nine Little Goslings" from 1893, by the same author. The chapters have name from well-known nursery rhymes — but are short stories. As so often in old books the illustrators name is a secret — except for in some ads for other books by the same author. I'm not so sure that I'll try any of the recipes from "New Vegetarian Dishes" (1892) by Mrs. Bowdich. Mr. Bell says in the foreword "If they are not all found to be palatable, the fault must be in the individual cook, who cannot have put in the important ingredient of feeling, without which no work can be wholly good." In a way I agree but at the same time wonder why bother to write cookbooks — if you have that feeling you don't need any! Most recipes in old cookbooks are rather boring with overcooked vegetables and very few spices. What do you think of these sausages? 1 ounce fine bread crumbs. 1 egg and bread crumbs. Mince the cabbage, boiled egg and beetroot very fine, mix with them the potatoes, bread crumbs, mint sauce, salt and pepper; stir well together, adding 62a teaspoonful of the beaten egg. Shape into twelve sausages, roll in the remainder of the egg and bread crumbs, and fry in boiling oil until a golden brown. Serve piled on a hot dish, and garnish with parsley. Peas, new potatoes, mint sauce and brown gravy should, when in season, be served with this dish. "The Doers" by William John Hopkins from 1914 is another illustrated book where the name of the illustrator remains a secret. It is an educational book where a five-year-old boy watches workmen building a house. 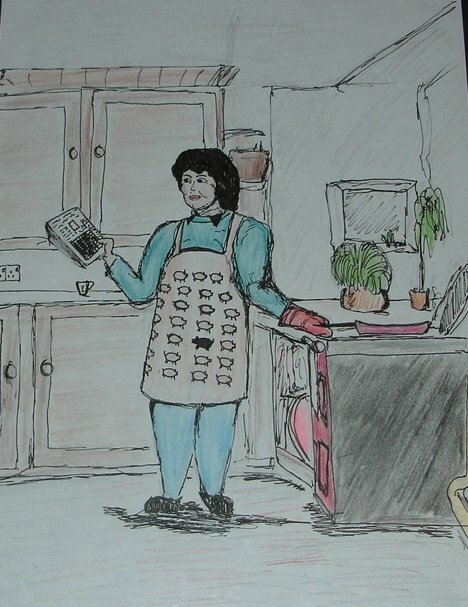 Margaretha, those sausages sound as if they might have come from the wartime cook book I was working from recently. I am so glad that vegetarian dishes have moved on. The illustrations are beautiful. I wonder why the artists were not given credit for their work? I guess people were used to the taste of bland overcooked vegetables - and thought food was supposed to taste so. Old books seldom gives credit for illustrations and translations - unless they already were famous like Walter Crane and Kate Greenaway, which probably made the books sell better. But I can't figure out why the less wellknown had to remain anonymous.